People always talk about air/fuel ratios, but setting the correct ignition timing on programmable management is at least as important to getting good performance, economy and responsiveness. The period between the spark firing and the complete combustion of the fuel/air mix is very short - on average only about 2 milliseconds. Ignition of the fuel/air mix must take place sufficiently early for the peak pressure caused by the combustion to occur just as the piston has passed Top Dead Centre, and so is on its way down the cylinder bore. If the ignition occurs a little too early, the piston will be slowed in its upward movement, and if it occurs too late then the piston will already be moving downwards, so reducing the work done on it. If the spark occurs much too early, the ignition pressure wave can ignite the mixture in various parts of the combustion chamber, causing detonation. If the composition of the mixture were constant (and it isn't! ), the elapsed time between ignition and full combustion would remain about the same at all rpm. So, if the ignition advance angle were set at a fixed angle before Top Dead Centre, then, as the engine speed increased, combustion would be shifted further and further into the power stroke. This is because the faster moving piston would be further down the bore by the time combustion actually occurred. To prevent this, the ignition advance must increase as engine speed rises. In addition to engine speed, the other major factor affecting the amount of advance required is the engine load. At light loads (ie when lean mixtures are used) the speed of combustion is slowed and so more ignition advance is needed. The emissions of an engine will be affected by the ignition timing that is used, in addition to the air/fuel ratio. Oxides of nitrogen increase as ignition timing is advanced. Running light-load advances of 40 or more degrees is common, giving good responsiveness off load, but if emissions standards need to be met, this advance may have to be reduced. On the other hand, the emission of carbon monoxide (CO) is affected very little by ignition timing, being much more influenced by the air/fuel ratio. At stoichiometric and lean air/fuel ratios, increasing the ignition timing can reduce specific fuel consumption substantially. Finally, the emissions of hydrocarbons at stoichiometric and rich air/fuel ratios increase with advanced timing, but timing has little influence at very lean air/fuel ratios such as 19:1. It's impossible to ascertain the best ignition timing by juggling all these interrelating factors on paper. Instead, making real-time dyno changes to the ignition timing while using an exhaust gas analyser or air/fuel ratio meter and a means of detecting knock is the only practical way of seeing how the ignition timing being used influences emissions, power and fuel economy. Some programmable engine management systems have a default cranking advance of 15 degrees, a value about midway through the range of appropriate cranking advances. Smaller engines with faster cranking speeds need a greater ignition advance (up to 20 degrees), while slower cranking speeds of a high compression engine will require less advance (down to 10 degrees). The compression ratio of the engine will also determine the likelihood of kickback on starting. Engines with a low static compression ratio of 8:1 will accept an ignition advance of anything from 0-20 degrees without kick-back. A 10:1 compression ratio will reduce this to 15 degrees, 11:1 to around 10-12 degrees, while race engines using very high compression ratios of 12-13:1 can sometimes tolerate no cranking ignition advance at all. Most engines will idle happily with an ignition advance of 15 - 32 degrees. This is a very wide range - some engines will certainly not be happy at 32 degrees and others won't be at 15 degrees! An overly high amount of ignition advance for a given engine will result in lumpiness at idle, excessive hydrocarbon emissions and sometimes exhaust popping, while too little advance will also cause lumpiness. If the engine runs closed loop fuel control at idle, too much idle timing advance can disrupt the oxygen sensor reading, causing the self-learning process to overly enrich the idle mixture. 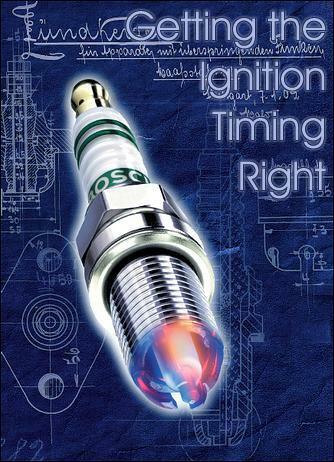 Setting the optimal ignition timing can therefore best be done by trial and error variations. Timing that is more advanced at slightly lower engine speeds than idle is sometimes used to help stabilise idle. This is effective because, when the engine starts to slow down, the greater ignition advance causes the engine to produce more torque, so increasing engine speed. Many factory management systems use ignition timing as a major element in controlling idle smoothness, with an increase or decrease in rpm at idle responded to by a change in timing advance. At light loads - as are used in normal everyday cruise conditions - an ignition advance of 40 degrees or more will improve responsiveness and economy. This advance can be used successfully on many engines - even those with an 11:1 compression ratio, if they are being run on high octane fuel. One factor limiting the cruise ignition advance that can be used is the maximum ignition timing attack rate provided by the ECU - that is, how fast the timing can change. If very advanced timing is being used with light loads and the attack rate is not high, there may be slight detonation when the engine load suddenly increases. The hotter the camshaft(s), the less advance that will be able to be used in light load conditions (the limiting factor being driveability rather than detonation in this case), however timing in the range of 35-40 degrees is still usually used. Engines with good combustion chamber design will be able to run up to 45 degrees in these conditions. Fuel economy and engine responsiveness are both very much affected by light load ignition timing. The torque output of a given engine is proportional to average cylinder pressures, so the full throttle ignition timing advance that is used should relate to the torque curve rather than power curve. The maximum ignition timing that can be used at peak torque is usually limited by the occurrence of detonation. A detonation limit is always the case in forced aspirated engines, but not always the case in naturally aspirated engines. As an example of the latter, one Porsche flat six developed best power with a maximum advance of 8 degrees, even though the engine did not detonate at even 27 degrees of advance! A Mercedes V8 engine was able to run 38 degrees at high rpm, peak load without audible detonation. However, best results came from a full load advance of 28 degrees. On a modified engine having increased compression and hot cams, a peak torque advance of 28 - 36 degrees can often be used. In a factory forced induction engine using a little more boost than standard, the peak torque timing will be around 18-22 degrees, while in a naturally aspirated engine converted to forced induction without internal modifications, timing should be well back at about 10 degrees. Because, as already indicated, most forced aspiration engines and many naturally aspirated engines develop best performance when the ignition timing is advanced close to the point of detonation, great care should be taken when setting the full-load ignition timing. To assess the maximum ignition advance that can be safely run at a given rpm and load, a dyno is a very useful tool. When the dyno is used in this manner, the engine is held under load at a single rpm and the ignition timing is slowly advanced. If the rate of power increase tapers off to zero (or in fact power starts to decrease), the timing should not be advanced further. If the power development of the engine starts to fluctuate rapidly, the timing advance is excessive. These power fluctuations can be clearly seen when a dyno is used in a steady state, expanded power scale, bar graph mode. Note that the power fluctuations occur well before detonation is audible. The ignition timing should be retarded by 2-4 degrees from the point of power fluctuations. The use of amplified earphones connected to a microphone clipped to the block is also a very good way of sensing when detonation is about to occur - the sound of the engine changes in a characteristic way even before detonation starts. But perhaps the best approach to detecting when an engine is detonating is to use equipment to read out the real-time output of the engine knock sensor output, or of any automatic ignition timing retard occurring as a result of knock sensor activity. Optimal ignition timing is that which gives a lack of detonation, the lowest exhaust gas temperatures, and maximum torque. From peak torque through to peak power, a modified naturally aspirated engine should increase in ignition advance to 36-40 degrees, a boosted factory turbo car should be running around 25-28 degrees, while an aftermarket, non-decompressed forced induction engine should be conservatively timed at around 15 degrees. If the engine uses reliable knock sensing and the ignition timing can be retarded quickly at the onset of detonation (and then re-introduced only slowly), more advanced timing than these figures can be used at high rpm. An intake air temperature correction chart that quickly pulls off timing advance with increased air intake temperatures can also allow the main table's ignition timing to be fairly advanced. For example, with an intake air temp of 120 degrees C, the timing can be retarded by 12-15 degrees, so providing an acceptable level of safety while still allowing good cool weather and short-burst performance. The importance of using a programmable ECU that has tables for the intake air temperature correction of ignition timing can be seen from this example. The ignition timing used during acceleration transients should have an attack rate that is quick enough to keep up with the timing requirements. This parameter is often specified as the maximum number of degrees per second change that is permitted. One source suggests that an attack rate as high as 650 degrees a second may be needed in some high performance engines. If the attack rate is not sufficiently high, mid-range detonation can occur in the transition from light load cruise (perhaps with 45 degrees of advance) to full throttle at peak torque (perhaps requiring only 15 degrees of advance). However, if the attack rate is set too high, slight changes in throttle will cause rapid, undamped jumps in timing which can cause minor detonation. This is especially the case at low engine revs - at higher rpm, the attack rate can also be higher. On deceleration (with injector cut-off working) most factory cars run retarded timing, such as 10-12 degrees. However, in modified cars this has been found at times to cause an exhaust burble, and if this is unwanted, more advanced timing (20 - 26 degrees) can be used. The amount of deceleration timing advance that is used may affect the strength of engine braking that is available.